I always like to try new foods where ever I travel. I do my research by looking up blogs, Google maps suggestions and/or Foursquare recommendations. What I look for is a specialty dish made by the restaurant but most importantly is the price of the menu. So here are some of my favorite places on Miami Beach. The first restaurant is Sibilla Cucina Italiana. At first I was hesitant to go here because it is kind of pricy. That is until I found out they had a 50% off special for the afternoon. It was a Saturday and I went for it. I ordered a Caesar Salad and the salmon. Some of the reviews had mention that the wait time was an issue. I didn't mind since I was starving and had some time to kill. 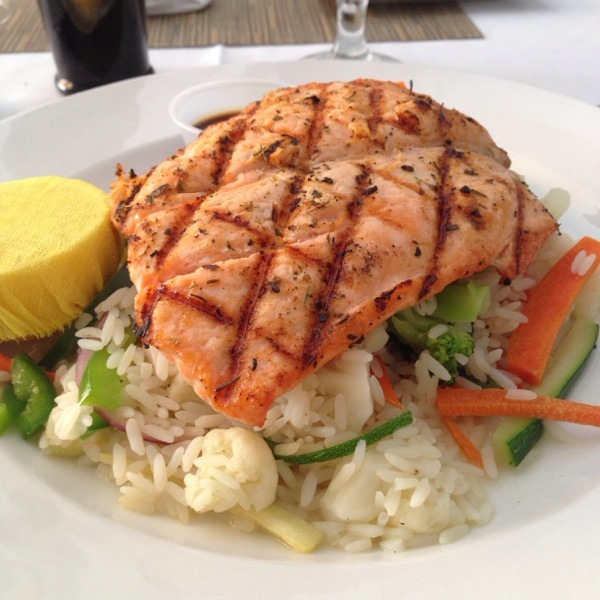 The salmon was moist, rice was thoroughly cooked, and the salad was refreshing. The total cost of the meal was $15 + a tip. Remember this meal was 50% off and it was worth it. If you ask any of my friends they can tell you how much I like Asian food. On this day my diet wasn't that great so I looked for a clean meal. It was quite a walking distance from the Catalina Hotel. I didn't mind because I could use the exercise. I ordered the lunch special. It was teriyaki chicken, two sushi rolls, two pot stickers and a salad. The ginger dressing on the salad was delicious. I have to agree with Foursquare that this is a great Chinese/Japanese spot. 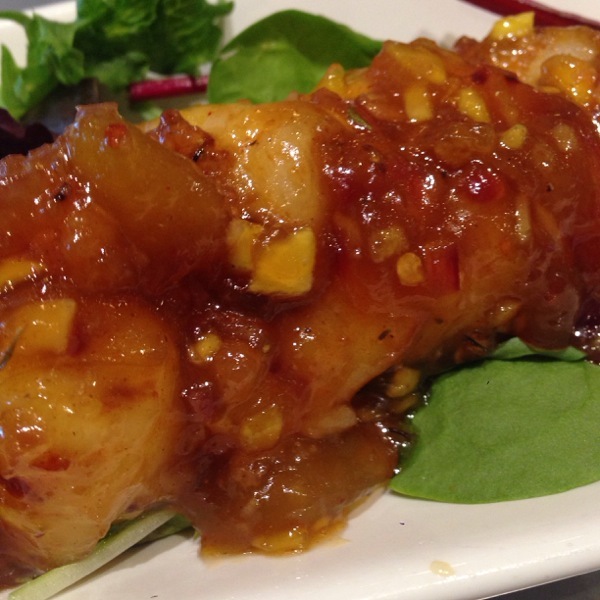 The Cafe at Books & Books offers a very tasty shrimp appetizer. I over heard one of the waiters tell another how much shrimp this guy ordered. Apparently he ordered 7 more servings after his first round of shrimp! I was sold and ordered a plate for myself and they were awesome! Then for my entree I ordered their famous Mahi Mahi sandwich. It was grilled on the outside and a little pink on the inside. That's the way it should always be prepared. The sauce was homemade and so was the salad dressing. It was so good that I finished both plates. Foursquare did good on this one. And the final place I recommend is Sylvano Restaurant. I had given myself the morning to spend as much time as I could at the beach. I typed "sandwich" in Google maps and this place was the closest. I left my wallet in the room because I didn't want anything valuable with me at the beach. My allowance was $20 for food. I ordered the Pollo e Mozzarella. It's a grilled chicken sandwich with mozzarella and a side salad. I fell in love with the first bite. The bread was freshly baked, the chicken was grilled to perfection and the mozzarella was the best I ever had. Many on Foursquare recommended this place as the best Italian on South Beach. I crave all these foods now. I will be back to Miami next year and these places will be on my list among others. If you have any recommendations please let me know.